After writing on this site for over 6 months, I decided it’s time to start sharing a little more with my readers. So, welcome to the inaugural edition of the Financial Slacker monthly update. June was a busy month both personally and professionally. It’s mostly good stuff, but still time-consuming. On the good and time-consuming side, we had swim meets four out of the last five weekends. For one of them we had to travel out-of-state. For those not familiar with the sport, swim meets are like long family road trips. There’s lots of sitting around for hours and hours in a relatively confined space. But you get to spend the time with your family. While I enjoy the time, it will be nice to have a little break away from the pool. Although it was resolved, we also had a little bit of a health scare in the family. When faced with these types of situations, it definitely makes you stop and think about life a little more. The month of June was also the last month for my parents bookstore. After being in business for over 25 years, they pulled the plug and shut down. I previously wrote about this. Although it is a little sad, it also opens a new chapter in their life. And finally, we welcomed two new additions into the Financial Slacker household. 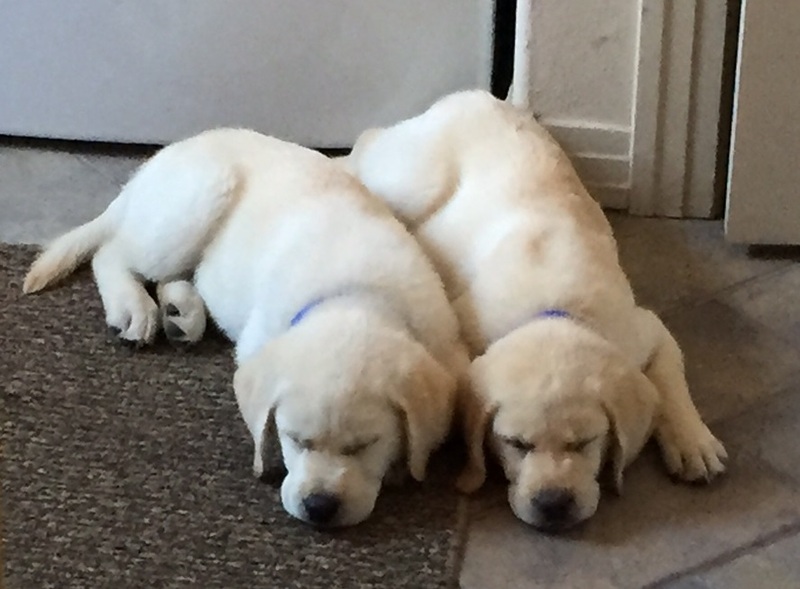 In May, we adopted two Labrador Retriever puppies – Argon and Ares – and our house hasn’t been the same since. If you have ever owned labs, you know they are quite the handful for the first two or three years of their life. This is our second time around with labs. We had to put our 14-year old lab down last fall. The good news is this time with two dogs, maybe they’ll keep each other occupied and get into less mischief. We’ll see. The Financial Slacker site continues to grow month-over-month. Since I started promoting the site in April, both page views and new visitors have increased five-fold. Also during that time, I wrote 36 posts that generated nearly 400 comments. I must say that writing and connecting with the personal finance blogging community has been a wonderful experience. It’s the most welcoming and engaging group that I have had the opportunity to interact with. Additionally, I have started to see a ramp up in private finance clients and recently wrote about one such project. I really enjoy this part of the business. It’s one thing working with big dollars for a big company, but when you sit down with an individual or small business, it’s completely different. These are real people with real financial situations. And it’s a great feeling when I can help them improve their financial futures. Beyond my little world, the great geo-political event that caught my attention as well as most of the world’s attention was the Brexit vote. I’m not going to put out an article with my thoughts on what it all means. I am not an expert. I wouldn’t even say I have much knowledge at all of the situation and certainly haven’t analyzed it adequately enough to make any recommendations. But I will say that sometimes timing is fortuitous. Over the years, I have gone back and forth on using an outside advisor. While Ms. Financial Slacker and I both worked full-time corporate jobs, it made sense to have someone helping manage our portfolio. But now that I am working for myself, I can spend the time. After thinking it through, I settled on the belief that if you want to know not just what you’re doing, but why you’re doing it, you need to self-manage your investments. I was never really sure what benefit we gained by having an advisor. It also felt like we were locked into an allocation that I wasn’t comfortable with. For example, over the past three years, we have allocated about 35% of our portfolio to international equities. This sector has continued to underperform. When I questioned the allocation, my advisor told me that he didn’t disagree that this segment wasn’t performing, but the “experts” in asset management believed in the allocation. That did not make me happy. So in the end, I decided that if my advisor couldn’t even change my allocation, I really didn’t have any need for him. As my own asset manager, my first priority was to modify our allocation. I reduced our international exposure from 35% down to 10% and redistributed the funds into fixed income and alternatives (primarily REITs). I then began a process of migrating the portfolio away from high-priced mutual funds and into low-cost index ETFs. With respect to changing funds, my decision was driven both by the higher fees I was paying as well as the performance of the funds. And, it’s not that my ETFs didn’t take a hit last Friday along with everyone else, it’s that I’m not compounding the loss by paying high fees to managers who also didn’t see the vote coming like it did. The Brexit situation again highlights that market timing is difficult. As I have gone through this migration process, there wasn’t too much logic to the timing of when I would sell a position and buy back in, other than looking at the market and deciding the time was right. I could have just as easily bought into the market on Thursday and taken a huge hit. Instead, I had migrated only a portion of the portfolio as of last Friday. In fact, I had been recently lamenting about how I was missing the small uptick in the market as I still had quite a bit of the proceeds sitting idle in cash. I had planned to reinvest a portion back into the market, but prior to the Brexit vote, the market was increasing. And I hate buying in as the market is going up when I feel that it is over-valued, so I wasn’t in a big hurry to put the money back into the market. And while the markets have bounced back, I was spared the impact of last Friday on a sizable portion of my portfolio. As discussed in another article, I organize my portfolio into three buckets – cash accounts, FIRE accounts, and retirement accounts. Cash accounts include both checking accounts and our money market account. The funds in these accounts pay for day-to-day expenses, cover any emergency cash needs, and any upcoming planned significant expenses such as school tuition. For at least the near future, I plan to hold more cash than normal. I’ve recently written about my concerns with the economy here and here. I am not preaching doom and gloom, but at this stage of life, our risk aversion is higher than it was when we were in our 20’s. I measure the value of invested assets in terms of how long it takes to rebuild rather than just the simple dollar amount. FIRE accounts include after-tax brokerage accounts, rental real estate, and other passive income streams. Income generated from these funds bridge the gap between active income sources and the age when our retirement accounts can be accessed. I have been looking at alternative investments for our FIRE account assets – specifically investing in rental property and/or dividend growth stocks. So again, this was another reason why I was holding off putting our FIRE money back into the market. I haven’t decided what to do with this money, but as I get a little further along, I’ll share my plans for the funds in our FIRE accounts. Our retirement accounts are fully invested with the exception of a relatively small amount in cash that has been earmarked for a venture debt real estate investment. These are pre-tax accounts and as such, have a long-term investment horizon. Since I won’t be accessing the funds for another 20 years, I’m less concerned about the volatility like we saw last Friday. The funds are invested in a relatively aggressive and diversified allocation with about 45% in stocks, 20% in bonds, 20% in REITs, and 10% international. The retirement accounts are up 2.1% YTD. But this performance was primarily generated in the mutual funds prior to my taking over in the last few weeks. I’ll see about putting together a more formal analysis of performance, net of fees before and after. Thanks for letting me share with you. I’m looking forward to July and another great month. I have a number of new ideas for the site and I am hoping to make progress getting our FIRE accounts reinvested. Readers, how was your month of June? Any big news that you could share with us? It sounds like you had a great month, Dave. Maintaining your blog must be tough with your busy weekends. June has been good. It is a month of transition and rest for me; I’m an educator living the summer vacation dream while also pursuing new part-time side hustles like real estate agency, financial consulting, and my blog. I’m trying to look at this time as setting the foundation for future success. Thanks, FinanceSuperHero. Enjoy the summer. I’m sure it will feel too short. You’re correct. I have struggled to keep up with everything over the past month. You would think with downtime at a swim meet, I could get some reading, writing, and commenting done, but it’s difficult. There are so many distractions. If I bring my laptop and put in my noise-cancelling earbuds, I can sometimes make it work. Plus with the summer months, the kids are out of school, but still involved in many activities. I am spending time being a taxi service as well. I’m envious of your time and focus to accelerate Financial Slacker! With a 2 year old and 3 month old at home, finding time to dedicate to Enwealthen is a constant challenge. Have you done any investing in P2P loans? I finally started this year, and it’s still too early to tell the long term ROI but it’s doing very well so far. Running the site takes so much more time than I thought. Whoever said blogging was passive obviously has never run a blog before. I have not invested in P2P loans even though I would like to. I live in New Mexico, and the last time I looked, the state had made P2P lending illegal. Essentially, a few years ago, they declared that P2P lending represented the unlicensed selling of unregistered securities. I haven’t looked recently to see if they changed their minds on this. And the sites won’t let you register if you’re from a handful of states including mine. If I could, I would be all over P2P lending. This sounds like a great month and a great plan going forward. My June saw my net worth grow and my heart hurt from Orlando and the pain I envision with the long-term ramifications of Brexit. Thanks, ZJ. June was a good month. I am so appreciative for what I have, and when I see what happened in Orlando and elsewhere around the world, it tears me apart. And honestly, I’m not sure what to expect with Brexit either for the people of the UK and Europe or for the rest of us. It’s definitely be busy, Thias. Sounds like you’re having fun with your daughter. Watching your children grow up and introducing them to new things is such a great experience. And when it comes to money, I agree, boring is the way to go. I agree more information is better. I’ve learned so much reading and writing in the personal finance space. Of course, there’s always more to learn. I’ll let you all know about what I decide for my FIRE assets. As you know, although it is time consuming, the blogging experience has been well worth it. And I think it has really helped me as consultant to see things differently and to articulate my thoughts. Nice to read about some of your personal updates, thanks for sharing 🙂 Was it your idea to get the dogs or someone else’s? Good luck with your private clients, sounds good for you. Thanks, Tristan. I do enjoy working with individusls. It’s a nice change from working with big companies. I would say Ms. Financial Slacker was the driving force behind the dogs. Her and the kids.